Please Note: This feature is an optional extra and must be activated. You can create a special offer by navigating to Rates > Special Offers > Create a new special offer, or, you can click on the 'Special Offers' item on the dashboard and then on Create a new special offer. Once you are here, you can start by entering a name and description for your special offer. Additionally, you may upload a photo to attach to the offer. If you chose not to upload a photo of your own, the special offer will use any available photos from the occupancies assigned to it. You can choose to 'shout about' your offer. This means that the offer will appear at the top of the results when somebody carries out a date search on your booking engine. Assign occupancies to your special offer by ticking the check-boxes beside each occupancy. Once this is done, you will have to choose how your offer will be priced. You can make the offer a 'Standalone Rate', which means that you will have to price each occupancy manually. Otherwise, you can derive the offer from one of your existing Rateplans or Special Offers, which allows you to add or subtract from the parent rate, i.e. 23$ on top of the parent rate. Once you have priced your offers, you can further configure the offer in the advanced options section. You can set a length of stay restriction, i.e. stay a minimum of 2 nights, or a lead time, i.e. 2 days in advance of arrival to organise tee times with the golf club. You may also choose whether the offer will always be available if rooms are available, or only available on the days that you open on the Rates screen. 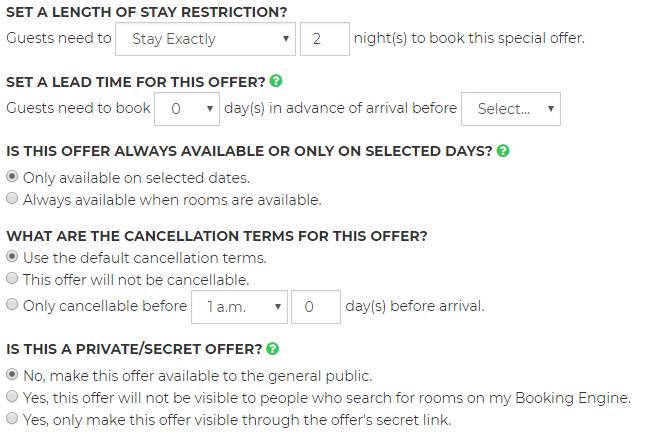 Finally, you can select what cancellation terms to use for your offer, and whether the offer should be secret. You can opt to make your offer a secret offer. A secret offer will not be available on the booking engine or the special offers page, but, it will be available through a secret link that you can share with people. Only individuals who have the secret link will be able to book this offer. More information on how the specific/secret offer link works can be found further in the article. Any upgrades packaged with the offer will be automatically included on the 'Enhance your stay' step on the booking engine, and can't be excluded by the guest. The guest will still be able to select any other upgrades available for the offer (i.e. not packaged with the offer). The price of the upgrades will be added on top of the offer price. If your offer is €50 a night, and the upgrade price is €5 per room per night, the rate advertised to the guest will be €55 for the night. Next, hit the save button and your special offer is ready! Now that you have created your offers, you can see them on the special offers page where you can manage your offers. Offers which are being 'shouted about' will display with a 'Shout About' badge. Offers which have been made secret will display with a 'Secret' badge. Furthermore, if you wish to sort your offers, you can do so by dragging and releasing the offers in the desired order. The booking engine will display the special offers in the same order they are in on this screen. There are two possible ways for your special offers to display on the booking engine. This is controlled by the 'shout about' option on each special offer. If you have chosen to 'shout about' an offer, it will be displayed at the top of the search results as shown below. Special offers follow slightly different rules from normal results. They will show even if there is a length of stay requirement, or there is no availability on the date searched but there is availability within a 7-day range around the date searched, in which case the availability table is shown. Unless it is the only result on the page, a special offer will always be collapsed by default to save screen real estate. Clicking on the 'Show more about this offer' text will expand the offer and show the full description and rates. If you have chosen not to 'shout about' your offer, it will be treated as a normal result and will appear in the rates section under the respective result. To make it clear that it is a special offer, an 'Offer' badge is displayed beside its name, as can be seen below. In the case of 'secret' offers, as the name implies, they will never be shown as a result on the booking engine. 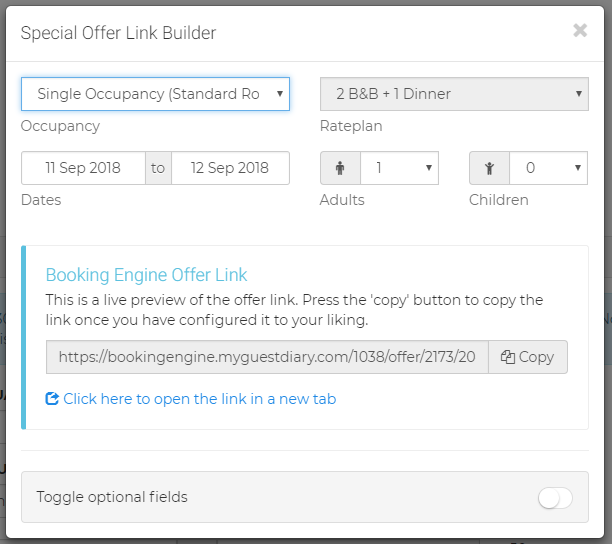 Once your special offers are created, you can obtain an individual booking engine link for each of the rates on your special offer by clicking on the generate offer link button. You will be presented with the offer link builder (shown below). Select your desired occupancy, and configure the dates and the number of adults/children to your liking. Simply copy the link or open in a web tab to view the offer and share it with your guests. The 'Toggle optional fields' option will also allow you to change the number of rooms or select a discount if available. If the Special Offers menu and dashboard items are greyed out, it means that you are not subscribed to this feature. If you wish to benefit from this feature, you will have to contact us to enable it.